L’Étape du Tour is an event in which mere mortals pit themselves against a stage that the Tour de France pros will be tackling in a few days time. Many train for months, even years, to manage it. 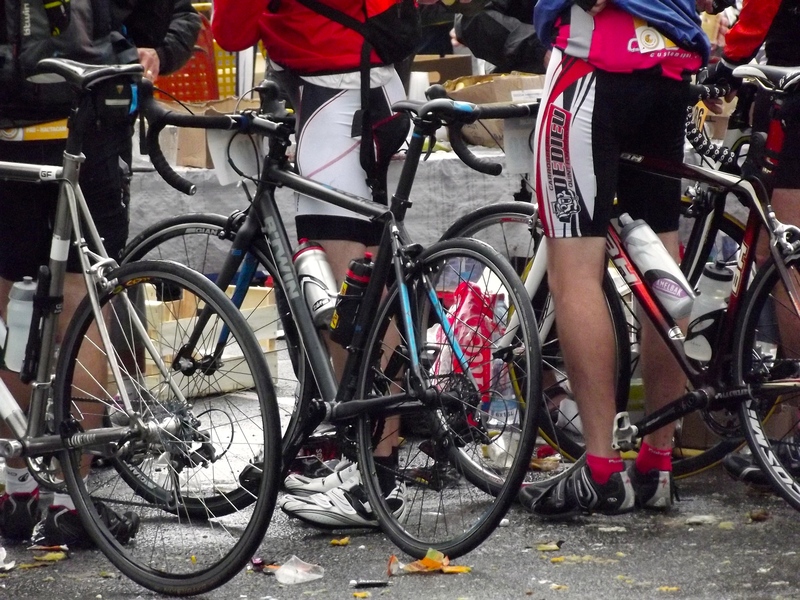 Others rock up with nothing more than a clean set of lycra and a devil-may-care attitude. 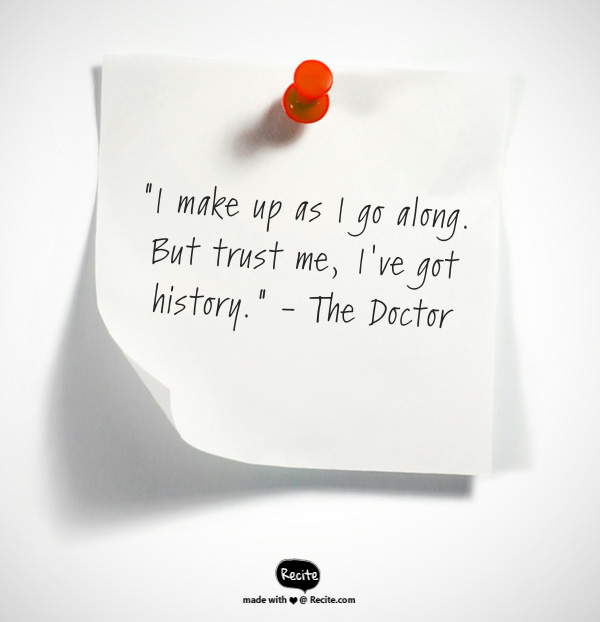 Some make it. Others don’t. 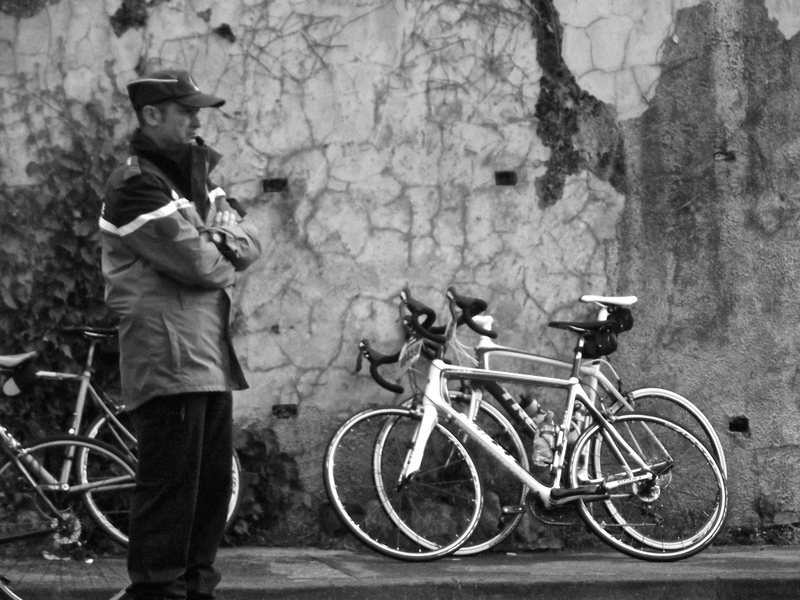 The ones that don’t are picked up by the coaches (some 25 of them, in fact) that follow along behind clearing up the broken souls littering the gutters of French villages. 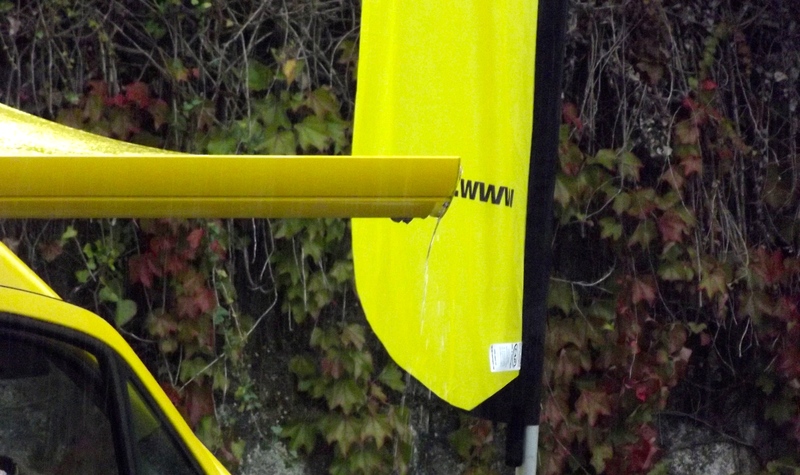 I saw L’Étape du Tour come through town for the first time this year. 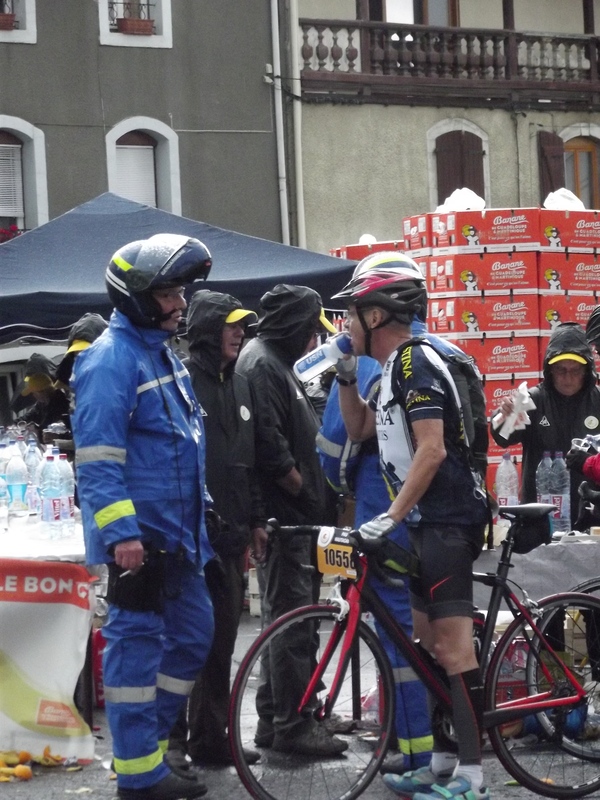 Our town at the time – Bagneres de Bigorre – was where the rain-soaked cyclists stopped for a well-earned bit of lunch and some mechanical tweaks on their way from Pau to Hautacam. 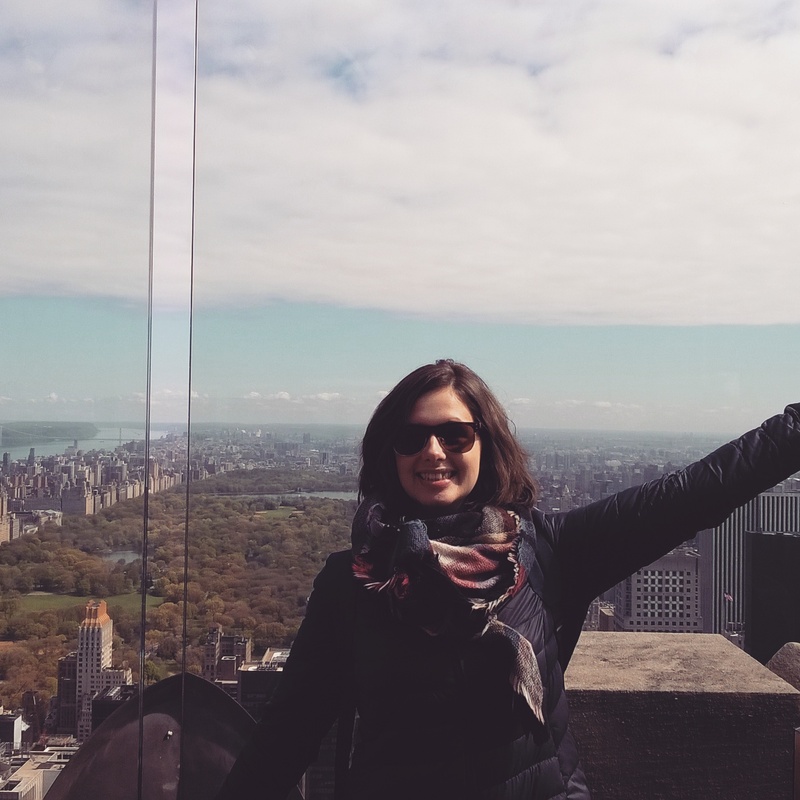 Here are some of the photos I took and things I saw. 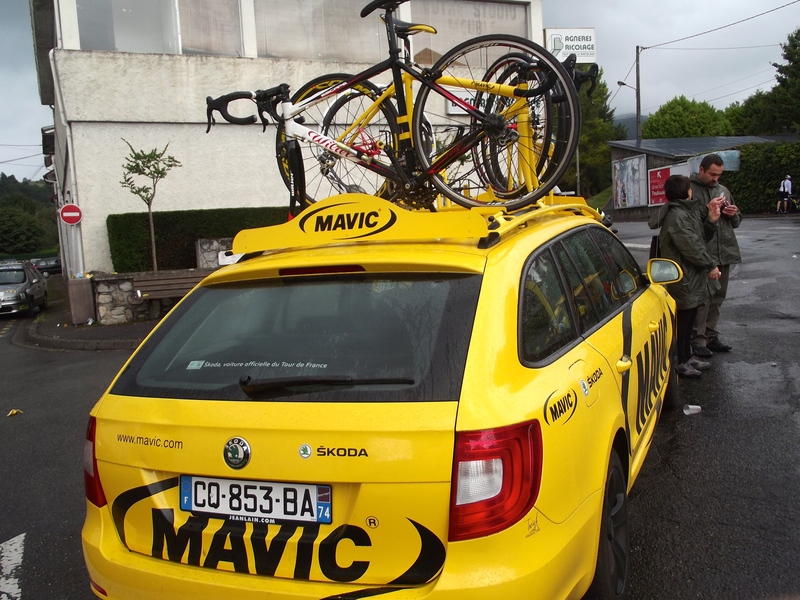 The Mavic van. This is where wet and weary cyclists dragged their steads for new inner tubes, patching up of tyres and tinkering on brakes. The engineers were largely fluent in French and English but if language failed then plenty of sign language seemed to work well enough. 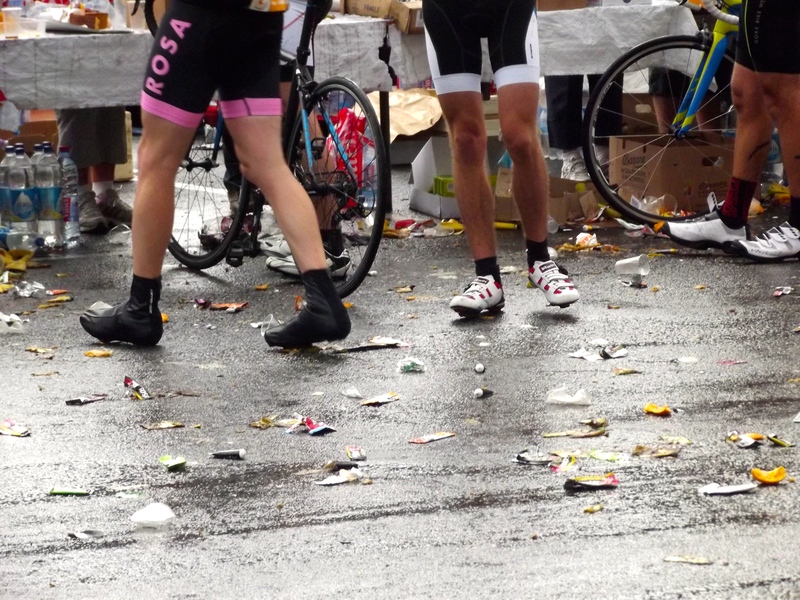 The rain was really coming down but the rider’s family and friends were still out on the roads. 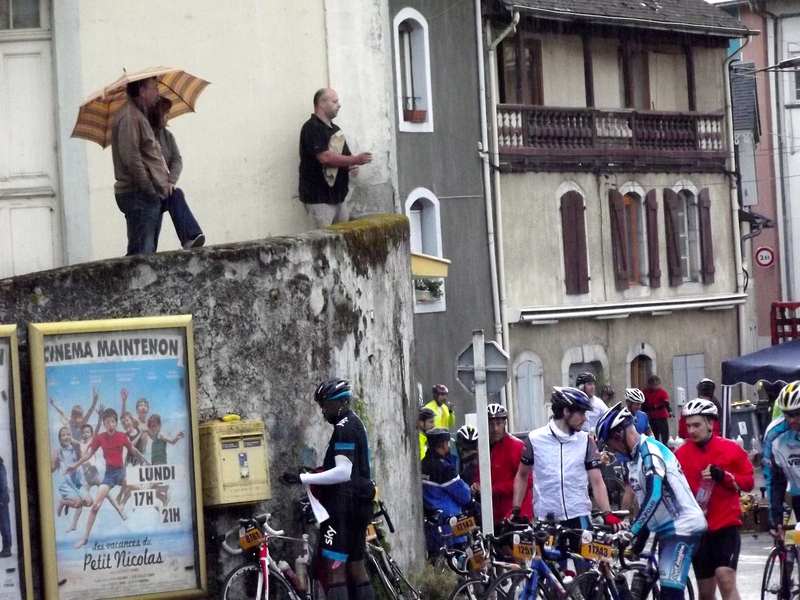 Locals turned out with umbrellas and newspapers over their heads to take a peak. There was a pause in the downpour whilst we were watching but the summit ahead of them was lost in low-hanging cloud, a grey-blue dense ceiling that they would have to climb through if they wanted to reach the finish line at Hautacam. The infrastructure around the race was just amazing. 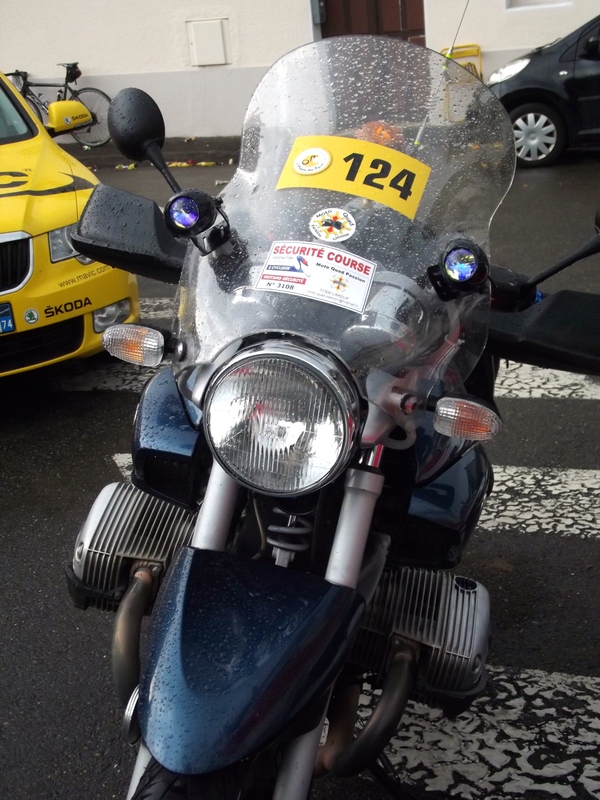 Security on motorbikes, gendarmes, engineer cars, ambulances, people handing out the lunches. 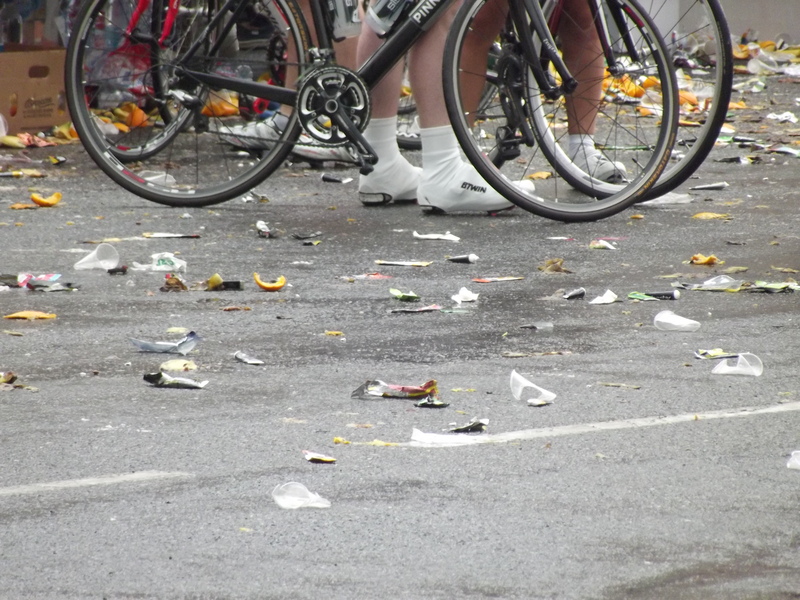 The sheer amount of people there who weren’t cyclists was unbelievable. It just shows seriously a country like France takes their cycling. The rubbish. 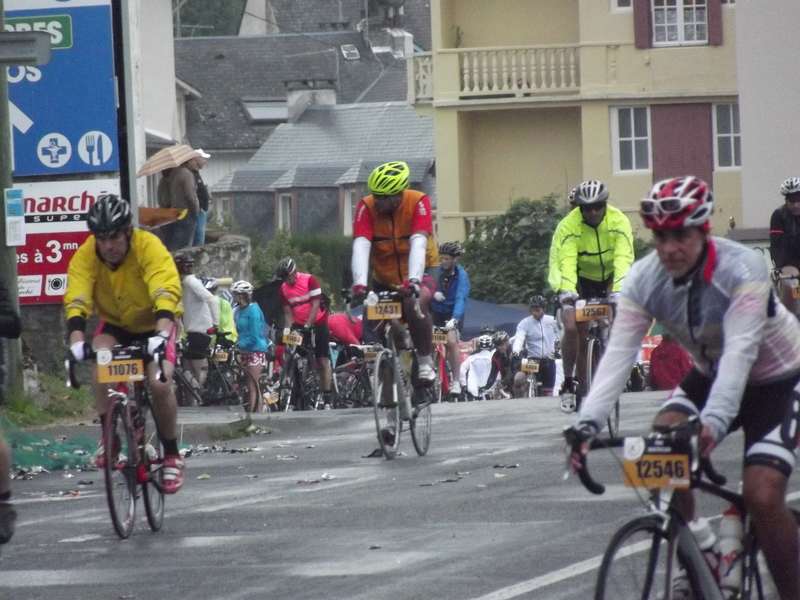 13,000 plus riders were on the road that day and they all stopped for lunch on the way. 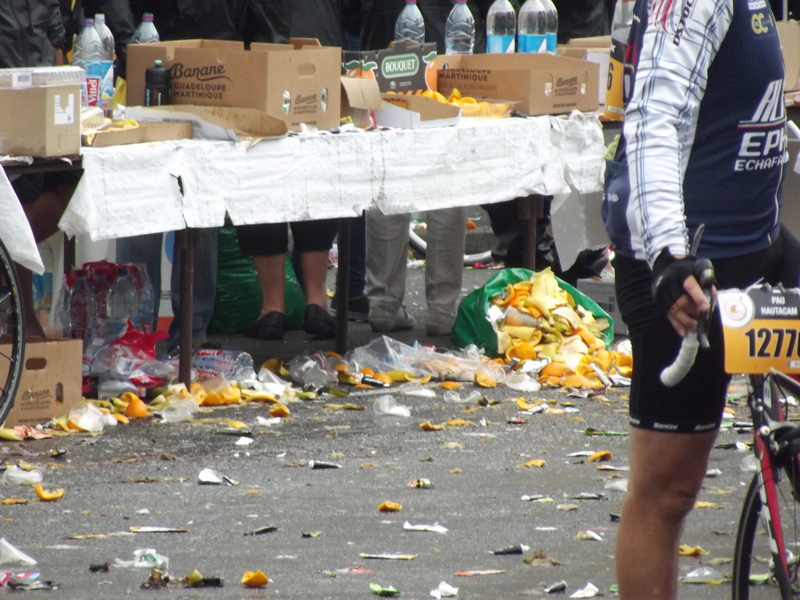 The feeding zone was a sea of lyrca-clad legs and bike spokes surrounded by discarded orange peel, gel pouches and plastic cups. The riders. Tough men and women, one and all. Many of them were chatting and laughing despite what they had just overcome and what lay ahead of them. Their steel-eyed determination as they powered off into the gloom deserved the applause and cheers of encouragement from those who turned out to watch. Like what you see? Whether you want to watch it with your eyes or peddle it with your legs, you can find all the information of the 2015 race here.